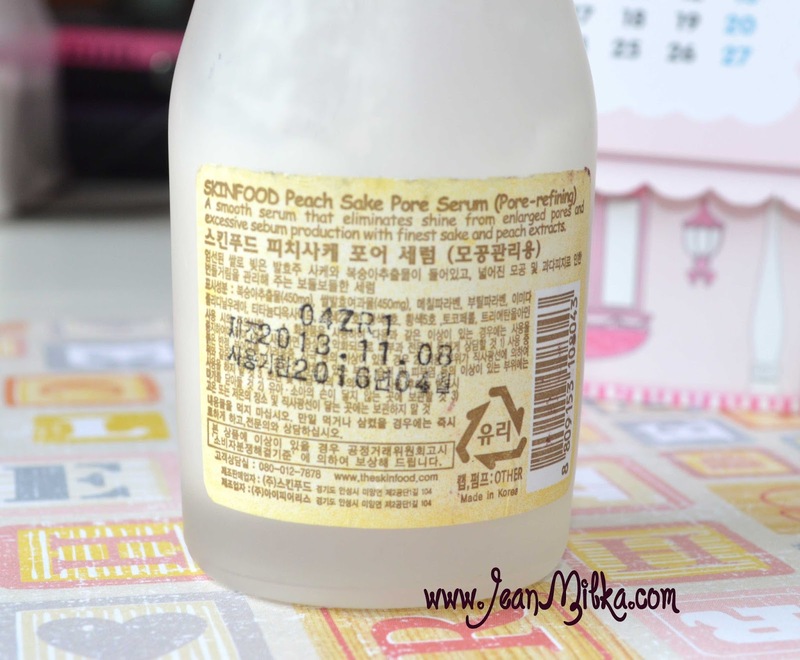 Today I would like to review one of the skin care product that I have used up after around 4 months which is Skin Food Peach Sake Pore Serum. I always try to find pore minimizer product since my biggest problem is pores. 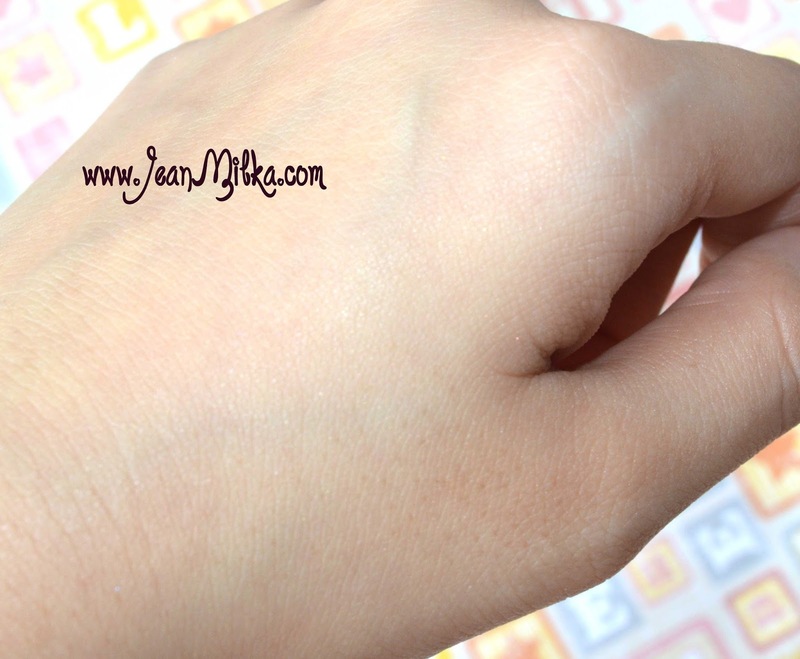 Before Skin Food Peach Sake Pore Serum, I used The Face Shop Pore Minimizer Controlling Essence *check out the review here*. I got mine from Audra Shop, and it was on stock that time and sells only for around 130.000 IDR where it cost more than 300.000 IDR at Skin Food counter. Korean beauty products is very expensive here, at Indonesia. One fact that I hate since I love Korean products. Let's just jump to the review.. I don't like most of Skin Food packing. It usually comes in kinda like recycle packaging. But I am happy enough with the pump, It works till I used it up. Eventually I don't like the cap that made from card board. The packaging might not travel friendly, since it was a glass bottle in dove finish, in term of weight. But it quite sturdy and won't broke. You can see the detail of the ingredients at the back of the bottle. 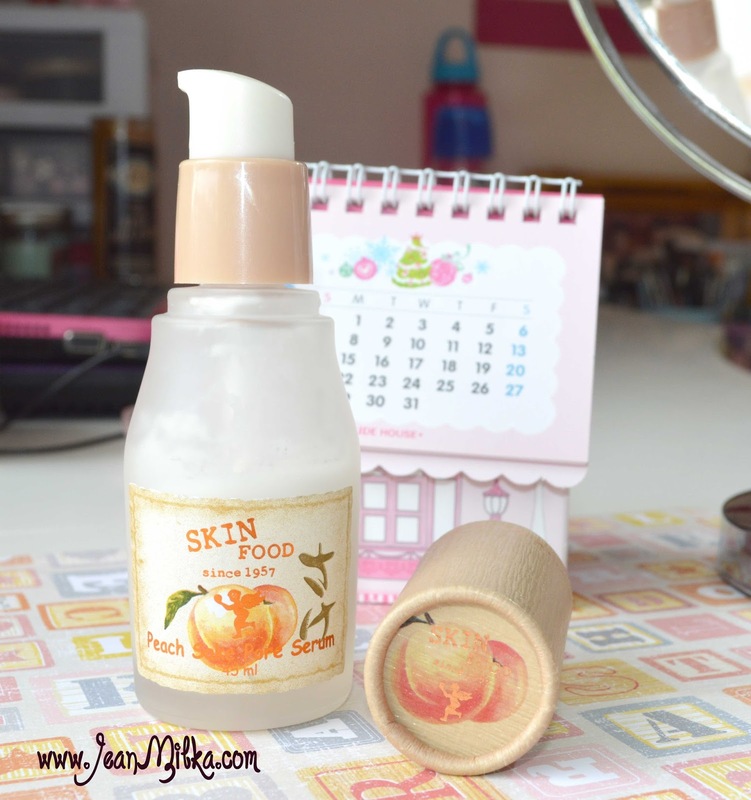 It claims that Skin Food Peach Sake Pore Serum is a pore-refining product that will give you smooth skin and eliminates shine. Peach sake serum also will control excessive sebum production with finest sake and peach extracts. I will give you my opinion after this. 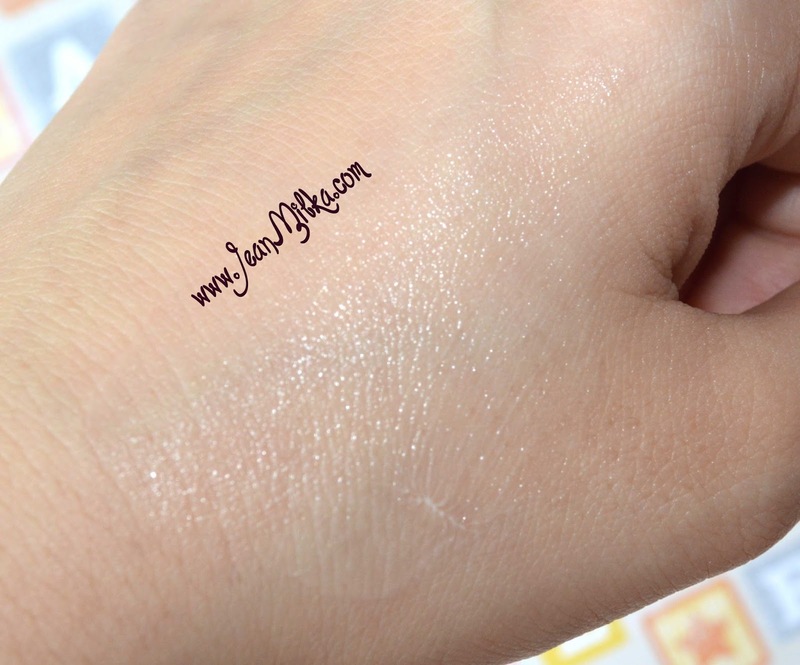 The texture is water cream based serum that will turn to powder finish after you blend it. I really like the powder finish that caused by silica powder in it. I am not sure what scents it have, maybe peach scents *not sure*. But it smells good and not too strong. It absorb very fast and doesn't leave any residue. 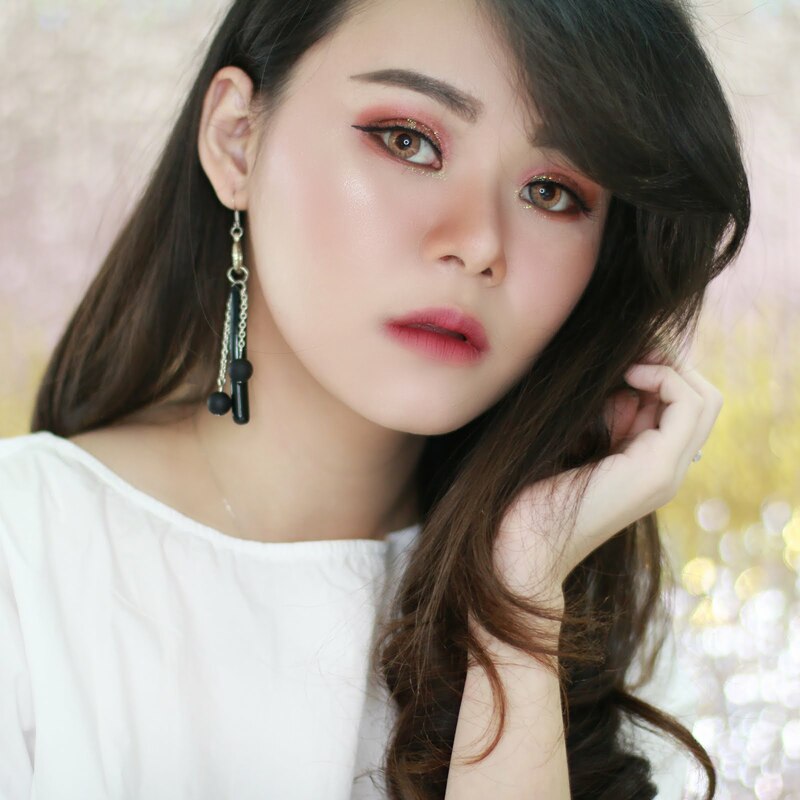 The powder finish make your skin feel smooth and less oily during the day. I don't think it will moisturize enough for dry skin, but it will works for oily to combination skin. I didn't see any result after used it up for around 3 months. It didn't minimize my pores at all. This product might works to control your sebum. Pores caused by excess oil and sebum, so Skin Food Peach Sake Serum probably keep your pores from getting bigger, but it doesn't minimize your pores at all, in my opinion. Even tho I satisfied enough with the powder finish that control my oily skin during the day and night. That is all for my review.. Readers : have you tried this product? is it minimize your pores? And do you have any recommendation that can minimize pores? 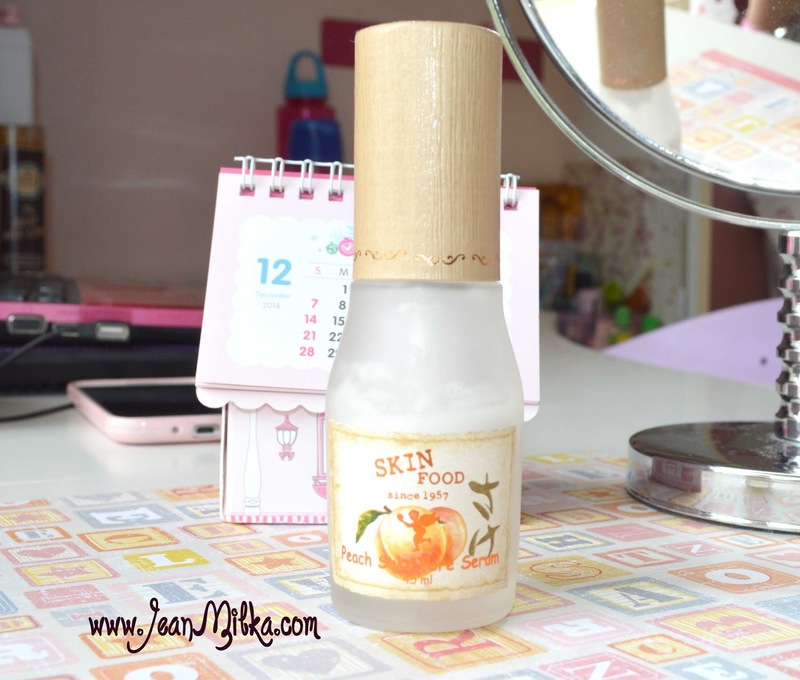 8 komentar on "Review Skin Food Peach Sake Pore Serum"
Pernah coba samplenya doank, baunya unik ya. Suka sama hasilnya itu lho bikin kulit kayak habis pake bedak baby. Packaginya berat banget kelihatannya hahaha. iya betul, kayak bedak baby gt. Hanya saja nggak ngefek untuk mengecilkan pori-pori, tapi mencegah lebih besar sich okay lah. Yup packaging nya heavy sich..
Looks like a nice product, I love it the BB Cream friom this serie of Skinfod! Thanks for reviewing this product kak.. jadi kalo untuk kulit kusam bisa membantu ga kak?